Do you know that by simply incorporating the most impressive bedroom rug ideas, you can immediately transform your bedroom from drab to fab? Just take a look at your bedroom. Do you feel like it is lacking something? Is there a wide empty space that’s making your bedroom to look dreary? If so, then consider the use of bedroom rugs! An impressive bedroom rug will not only enhance the look of your bedroom but will also help to make the space feel cozy and warm. So here are some of the most impressive bedroom rug ideas that will surely inspire you to recreate the look of your bedroom. The decor of your master bedroom should represent you – your own individual style, character and personality. Above all, it should provide a feeling of coziness, comfort, warmth and relaxation. Thus, when it comes to master bedroom rug ideas, look for something that depicts your personality. Since you are sharing your room with your partner, then you must also need to consider your partner’s ideas. You can perhaps go for a rug that you can place under the bed, or opt for a long yet simple one. There are several other designs to consider. To give you some idea, check out some of these master bedroom rug ideas. Under the bed rug that sticks out a bit for your feet to step on. The brown colors of the rug matches with the wooden furniture. 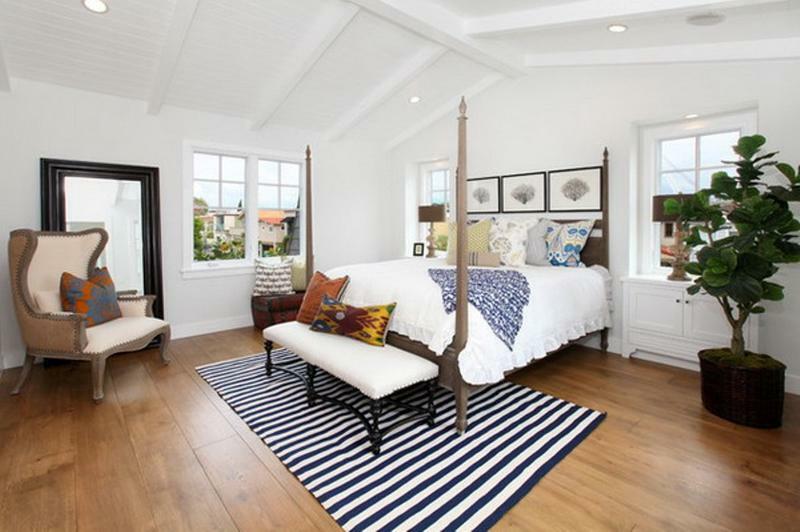 Striped rug gives the master bedroom an illusion of a bigger space. Fluffy bedroom rugs can work well with other areas of the house. Abstract rug offers some flair to the bedroom, making it to look vibrant and bright. White rug gives off a sense of luxury and comfort. When people think of modern and contemporary interior design, they often associate it with restrained color application and monochromatic schemes. But when it comes to your modern designed bedroom area rugs, there is actually a whole lot more than monochromatic color schemes and muted colors. These days, you will find that there are absolutely so many designs to choose from when it comes to decorating your bedroom with a modern area rug. You can settle for dark and black and white combination or opt for a vivacious and more romantic approach, or perhaps, go for the more flamboyant Victorian inspired rugs. If you are someone who loves clean lines and minimalistic classy designs, then the modern designed bedroom area rugs will suit you best. Here are some ideas to consider for your modern and contemporary bedroom rugs. Victorian inspired rugs give off a Classic flare to your modern space. Minimalistic area rug is perfect for modern designed bedroom. A zebra print area rug is perfect for this chic modern designed bedroom. A round area rug adds some flare to a modern bedroom. 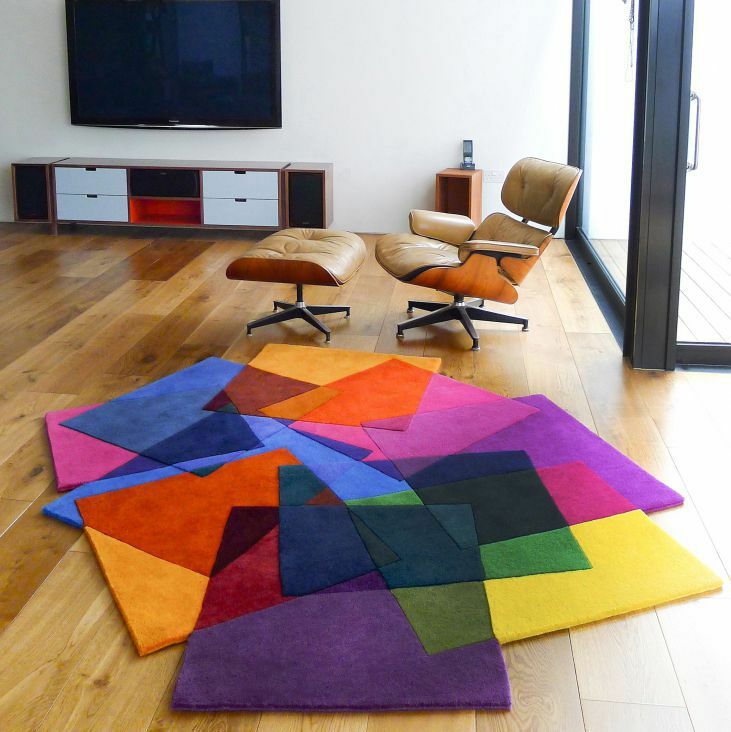 Add color to your modern room with this colorful area rug. Hardwood and laminate floors are among the most popular choice of flooring for bedrooms. They are not only beautiful but they also last for a very long time. Placing bedroom floor rugs on your hardwood or laminate floors will not only make your bedroom look amazing but it will also make the flooring comfortable and cosy to step on. Furthermore, the rugs can also help to keep your laminate flooring protected. They ensure that your flooring will not get dirty or scratched easily. In fact, they are great for areas with high traffic. You can place them under the bed or on some other areas to help define the space. The soft rugs will also make a great contrast against the hard and smooth surface of your floors. When choosing the best bedroom floor rugs, there are lots of factors that you should consider. If you live in areas having cold weather, then choose those throw rugs for bedroom that provide warmth and comfort. They should be able to provide insulation and must be cozy enough to step on. Think of the color and the design too. It’s important that the rug also matches with the rest of your bedroom decor. Using an underlay between the floors and the rug is also a great idea. Aside from protecting the floors, the underlay can also provide more warmth and comfort to your feet. It will serve as a cushion on your floor, and thus, walking on the rug will be even more comfortable. To give you an idea, here are some of the best rugs for hardwood or laminate floors. A colorful area rug will make a beautiful contrast against the hardwood floors. A plain white rug under the bed can make the hardwood floors to stand out. Gray area rugs look great on white hardwood floors. Coastal inspired rugs are great for cottage style bedrooms with laminated floors. Rugs can help to define the space of any room. Thus, if you have a spacious bedroom and you want to make the space look even better, consider decorating the space with rugs. 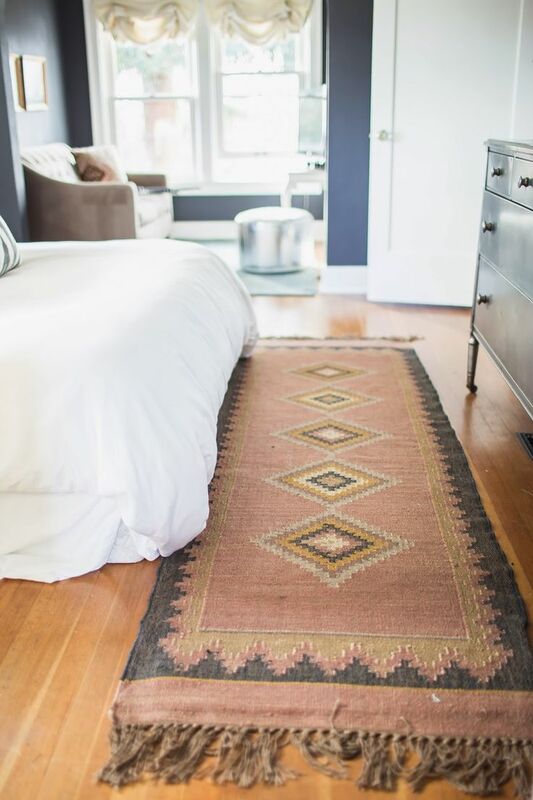 Do not skimp on size when looking for rugs to decorate your expansive bedroom. Large bedrooms require large bedroom rugs. The rugs can help to set boundaries in the space and ground the furniture and fixtures. 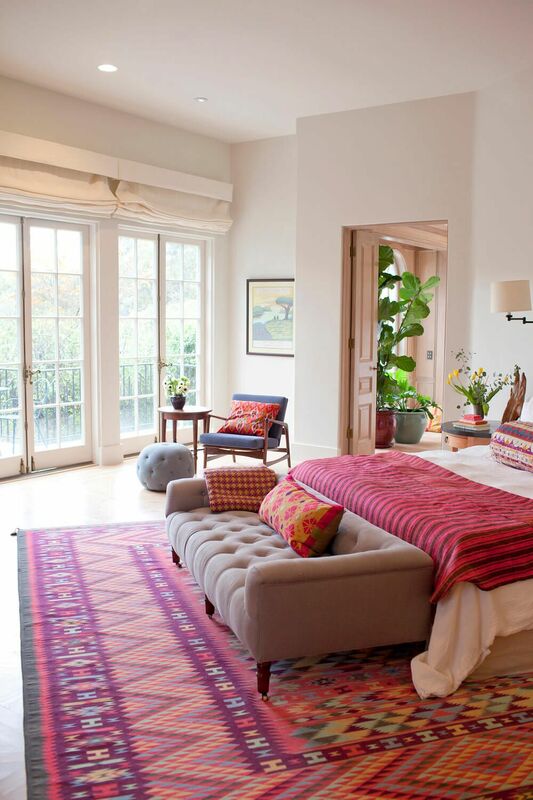 In a bedroom, the rug helps to define the sleeping area. Thus, the rug should be large enough so the legs of the bed will be on it. Of course, you also want to feel the rug with your feet the moment you get up. If your bedroom is narrow and long and you want a more affordable option, consider decorating two rugs beside each other. Connect them with a carpet tape, which you can purchase from any hardware store. If you are decorating your large bedroom from scratch, begin by choosing a large bedroom rug. It is an important bedroom accessory that ties the room together. Do not wait until you have placed all the furnishings before you decide on the rug as you might have a hard time in finding the perfect rug to complement with the decor. In addition, consider the use of patterned or printed rugs. A lot of people tend to settle with plain and minimalistic design when it comes to large rugs. If you want to create a vibrant and happy space in your bedroom, then do not be afraid of patterns and prints. If you’re in the process of decorating your bedroom, here are some ideas to consider for your large bedroom rugs. When it comes to bedroom decorating, opting for small throw rugs for bedroom may be a good idea. Depending on the placement, the small bedroom rugs can help to enhance the look of both big and small sized rooms. They are great for those who do not want to spend a lot of money when it comes to their bedroom rugs. But just because they are small doesn’t mean they cannot make your bedroom to stand out. The key is in choosing the right design and color that will coordinate with your bedroom decor. Choose the bedroom floor rugs that match with the color and design of your bedroom furniture. They should complement with the colors from your bed, chair, benches, window treatments, wall art etc. If you wanted to strengthen the color scheme of your bedroom or add new color, match the rugs with your accent pillows that rest against your headboard. This will create a harmonious effect in your bedroom. You can also have two small rugs in your bedroom. Perhaps, you can place matching runners on each side of your bed. This idea is perfect for the master bedroom. 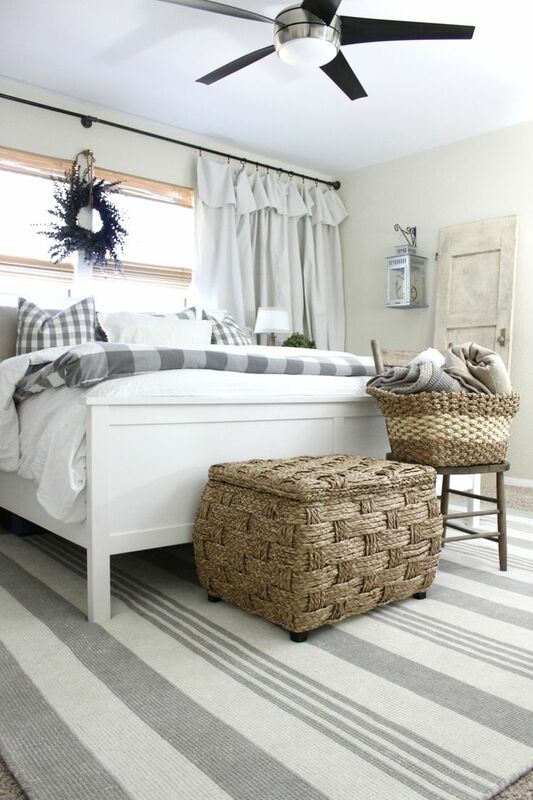 Another idea is to place a small area rug under the nightstand parallel to the bed. For more design inspirations, here are some small bedroom rug ideas to consider. Runners work best on the sides and end of the bed. Dark pink rug complements with the dark pink chair. Oval shaped animal print rug adds a touch of uniqueness to the bedroom. 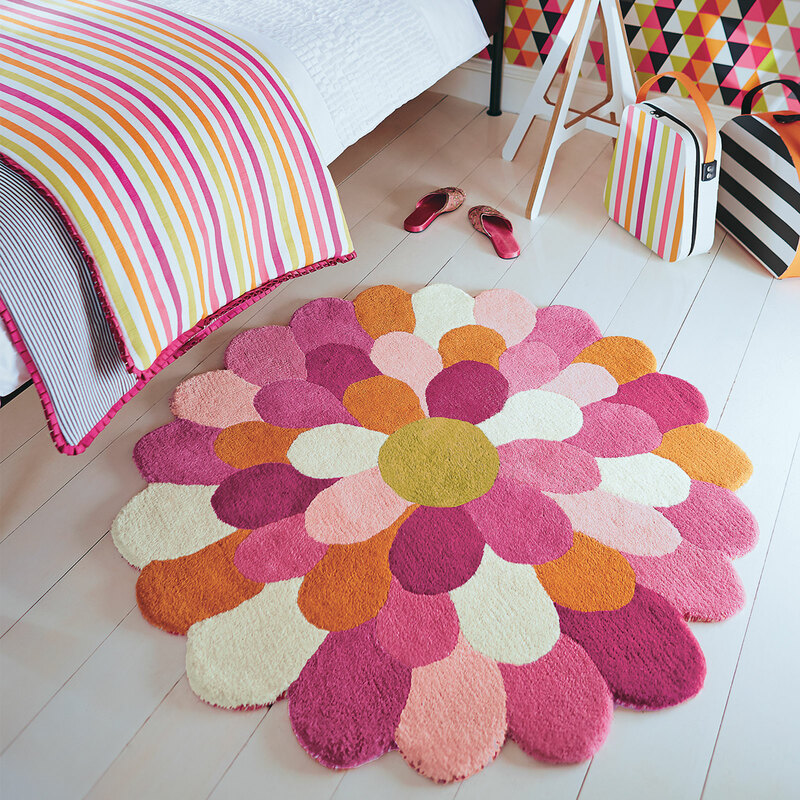 Flower shaped rugs are great for kids’ bedroom. A small area rug can be placed in between two beds. This black bedroom rug beautifully complements the bedroom furniture. Whether you are decorating a master bedroom, modern designed room, small or large room, or perhaps a bedroom with hardwood floors, these bedroom rug ideas can serve as your inspiration. Remember, the key is in proper placement and color coordination.